This is one of the latest brilliant handiwork form pasta maker Marella. 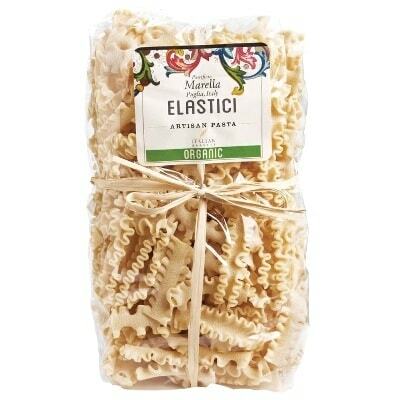 This bag of organic Elastici looks like miniature lasagna, or a shorter Mafalda. Whichever way you choose to look at it though, it doesn’t change the fact that this yummy dry pasta can be great with meat and thick cream sauces. Some Ragù, Besciamella, or Carbonara, perhaps? Prepare it on special occasions, or just when you’re simply looking for something good to serve during dinner. With its beautiful wavy edges, you’re sure to have some fun cooking this pasta. So grab a bag now!